Manipur has always been an ecologically preserved state since ancient times. The Loktak Lake is famous all over the world for having a pristine ecological environment that hosts the world's only floating lake. 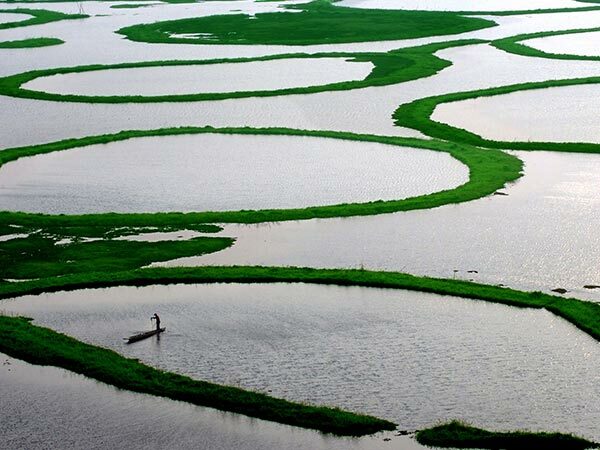 Situated in the Moirang district of Manipur, Loktak Lake attracts tourists, wildlife enthusiasts and conservationists from all over the world. Loktak Lake hosts the world's only floating national park, which is the Keibul Lamjao National Park, that is a natural habitat for the brow-antlered deer or the Sangai - which is the state animal of Manipur. Along with the national park, Loktak Lake is also home to the world's only floating school and floating resorts, which are catered by the government and thus, preserve the core foundations of ecological tourism. Thus, the entire place is well known for its preserved and pristine ecology, calm and serene atmosphere and picturesque sightseeing. Manipur experiences a pleasant climate round the year with heavy rainfall. The temperature varies between 20-25 degrees round the year, so it is perfect to visit during any season. However, winters are pretty cold in the hills and proper clothes must be carried during the visit. Loktak Lake is situated near Moirang in Manipur and both public and private transport is available directly to the destination. By Air - The nearest airport is Imphal, which is the capital city. From here Loktak Lake is just 48 km and cabs are readily available to take visitors there. By Rail - Dimapur is the nearest railway station which is about 215 km from Imphal. From Dimapur buses are available to Imphal. By Road - Moirang is connected to Imphal via NH53. Public buses and cars are also available from Imphal to Moirang. The catchment area of Loktak Lake is about 980 square kilometres, on which lies the floating heterogeneous vegetation (phumdis) that covers the entire lake. The largest phumdi is about 40 square kilometres and on this phumdi, the Keibul Lamjao National Park stands. It is the world's only floating national park. It is home to the endangered sangai and migratory birds flock in seasonally giving the entire area a majestic view of exotic wildlife. The area has a rich biodiversity of heterogeneous flora and fauna. India's only indigenous ape species, the hoolock gibbon, is also found here. The pristine and ecologically conserved island is located on one of the phumdis and is an excellent site to lodge for tourists. The area is famous for some native fish, including major carp and grass carp, and delicacies cooked from these fish are readily available. From the Sendra Island, one can have a bird's-eye view of the local habitations and culture of the people residing on the floating vegetation. The world's only floating school is also located in close proximity. The INA Museum built in the memory of the INA freedom fighters displays their courage, honour and valour through memorabilia, ranks and uniforms. An erect bronze statue of Subhas Chandra Bose in located in the compound. This renovated war memorial was the place where the first tricolour flag was hoisted on 14th April 1944.